Add a touch of distinction to your medieval, Renaissance, or fantasy looks when you choose the Leomar Canvas Shirt as your top. This long sleeve mens shirt feature a high collar and stylish lacing down a unique front chest placket. The lacing begins underneath the high-neck collar and extends down to mid-chest length upon an exaggerated, angular placket with a distinct downwards point. The long, straight sleeves lend practicality to its classic shape. 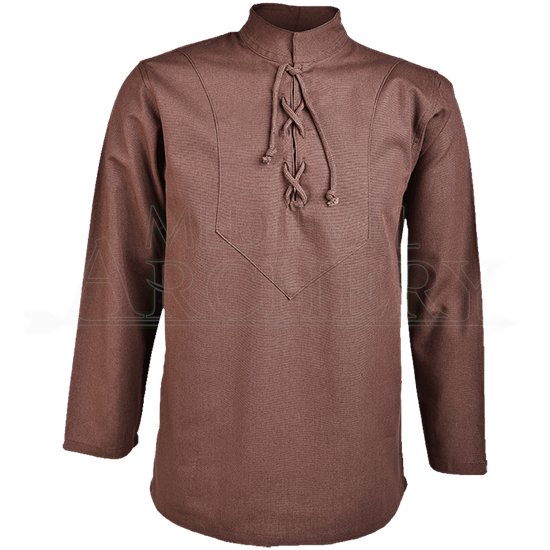 Ideal for medieval noblemen or rugged outlaws with a taste for stylish essentials, this historical reenactment shirt is made of sturdy cotton canvas and works great for LARP events, Renaissance festivals, theatrical performances, and more. Bring gentlemanly flare to ensembles of any era with this remarkable reenactment piece.